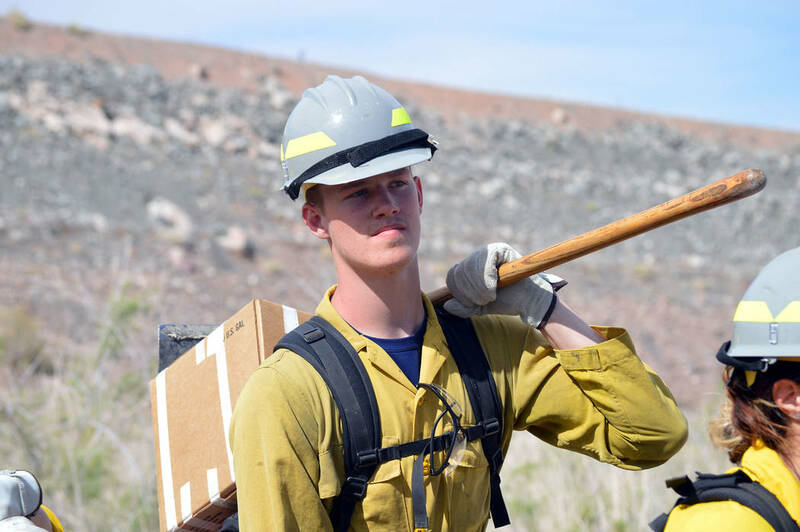 On April 27, Lake Mead National Recreational Area in Boulder City was home to a field day that highlighted the efforts of young adults from Las Vegas to become wildland firefighters with the Southern Nevada Interagency Handcrew. 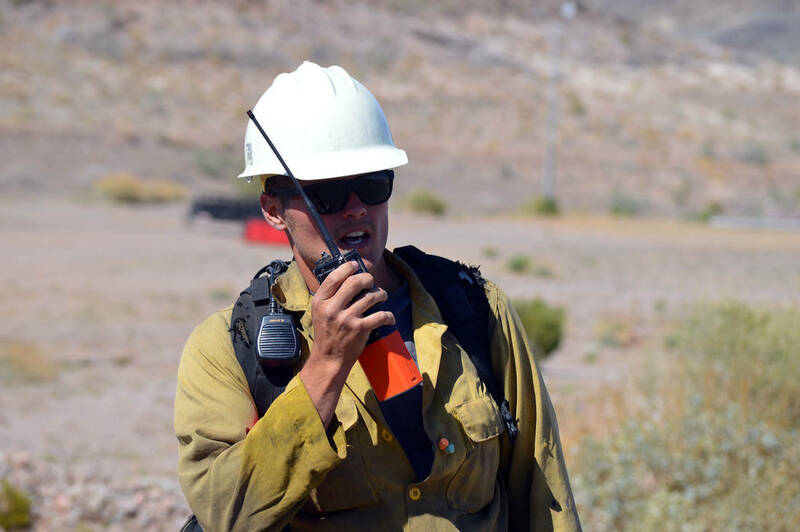 Celia Shortt Goodyear/Boulder City Review Jason Douglas gets the details of the scenario he and other wildland firefighters participated in at Lake Mead National Recreational Area for Wildland Fire Rookie School Day on April 27. 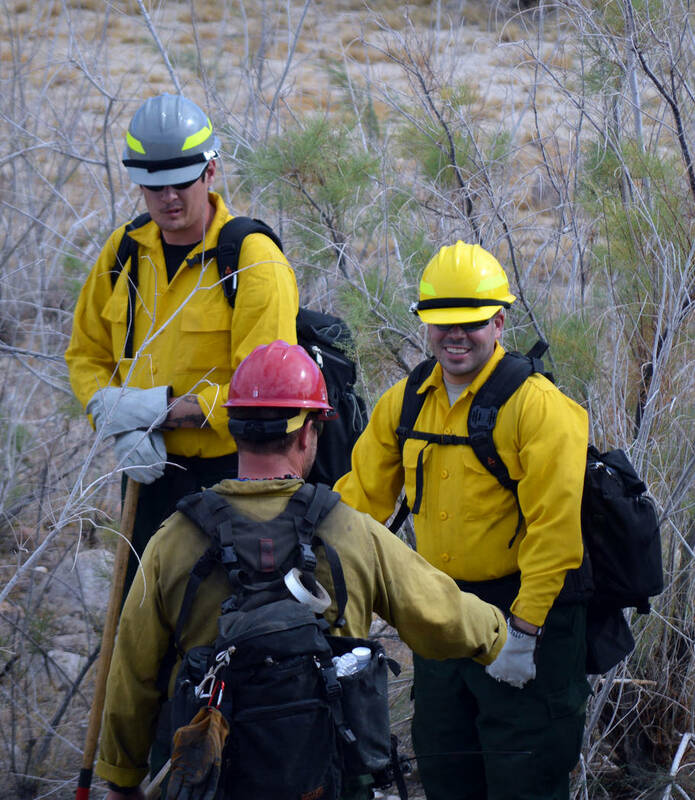 Celia Shortt Goodyear/Boulder City Review Zack Child waits with his crew to start putting is firefighting skills into practice at Lake Mead National Recreation Area on April 27. The event was part of the Wildland Fire Rookie School Field Day. 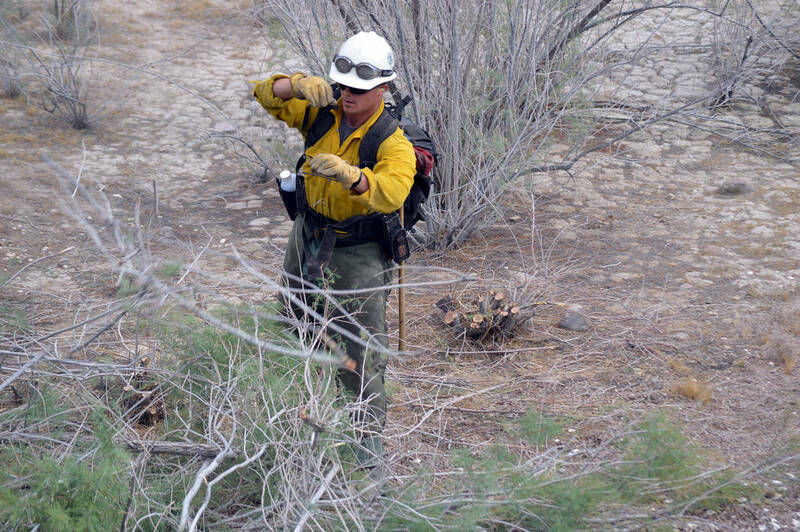 Celia Shortt Goodyear/Boulder City Review Kevin Alhers clears some brush during a practice fire scenario at Lake Mead National Recreation Area. Celia Shortt Goodyear/Boulder City Review Colin Gundle, center, gives direction to Joshua Shuler, left, and Matthew Medoff as they prepare to hone their firefighting skills. 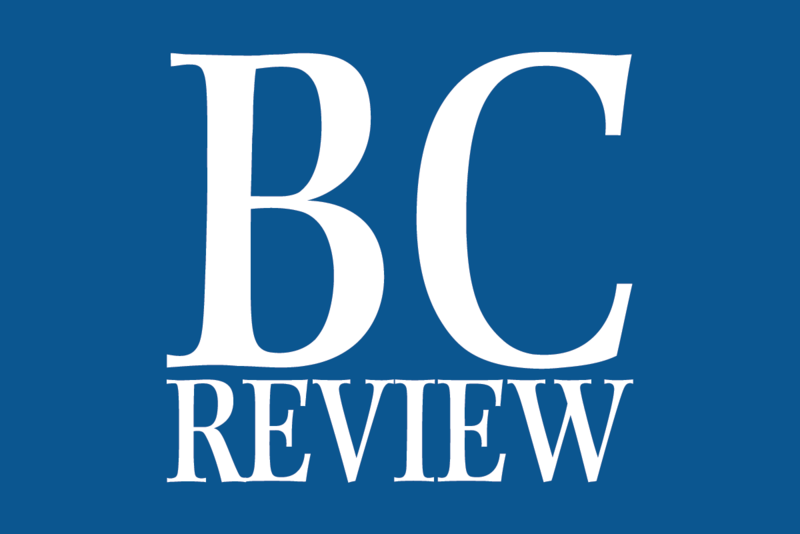 Celia Shortt Goodyear/Boulder City Review Mariano Del Real swings a Pulaski, a special hand tool used in wildland firefighting, during his rookie training day at Lake Mead National Recreation Area. 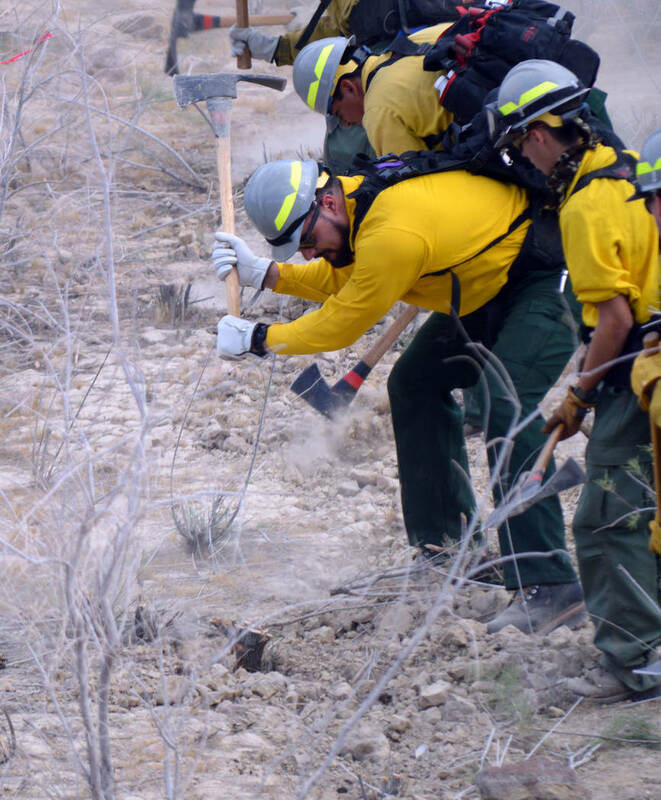 The crew, made up of 18- to 20-year-olds, started its training four days prior and participated in a fire scenario, which allowed participants to use skills in fighting a wildfire, communicating and working in a group. They performed an anchor, flank and pinch maneuver. In the anchor portion, crews start fighting the fire. During the flank, they move around the fire from that point. In the final part, pinch, they close off the fire at the other end and contain it.